By default, Koordinates offers the option of adding a Creative Commons license to your data. However, administrators also have the capacity to load a custom license, which can then be applied to individual data layers. In the menu of options at the top of your screen, select Legal & Licences. 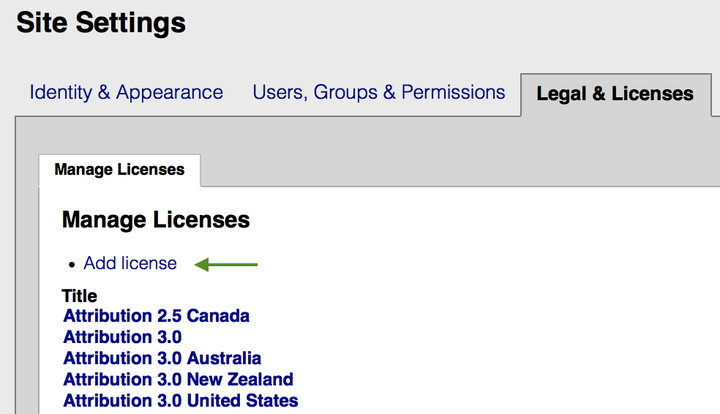 This will give you a long list of licensing options provided by the site, as well as the option to Add Licence. If you wish to add a custom licence, select this option. If you select Add Licence, you will be able to add a number of fields. Complete these fields with your custom license and click Preview or Save. If you click Save, your custom licence will be added to the list of licensing options on your Koordinates data service.